Best of Times happy to be in Ganges Harbor. We awoke in Ganges feeling rested and ready to take on a crossing of the Strait of Georgia with a dry companionway. We decided to make one more quick trip into Ganges before departing, given that we had to time our trip to occur at slack at Dodd Narrows. So we walked around, bought some killer cookies and hand cream at the grocery store, and ended up standing in line waiting for the liquor store to open. It’s a bit scary, seeing yourself waiting impatiently on a Monday morning for the liquor store to open. I shared the sidewalk with two…gentlemen who seemed far more desperate than I for the unlocking of the door! All I was trying to do was replenish our wine supply, as it can be difficult to do so once in Desolation Sound and beyond. Walking the docks at Ganges. "No Karen, you cannot take it out for a spin". Anyway, we had a nice ride to Dodd Narrows, a passageway that we had to get through at slack. It’s a very narrow spit of land where all the water needs to flow through a few time a day, so it makes for some impressive rapids. We arrived early, and had to wait for all the southbound traffic to come through (one at a time, single file) before we could be on our way. Our wake on the way to Dodd Narrows. The wise mariner makes a quick passage when the weather is this nice. The weather forecast was so good for the Strait of Georgia that we decided to skip Nanaimo and just keep on going. The winds were out of the Northwest and we had 1-2 foot chop with swells, but mostly it was just a great ride to Pender Harbor. On the lookout! There is lots of tugboat traffic. 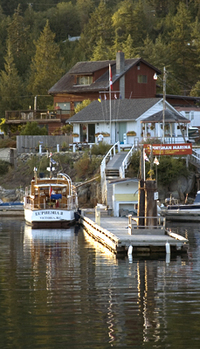 The tugboat is just above the orange arrow and its tow is noted by the yellow arrow. Between the two is about a quarter of a mile of steel cable hidden below the surface waiting for the mariner that does not give these vessels a wide berth. Bob and I like Pender Harbor with its miles of shoreline. We decided to anchor in Garden Bay for the evening. Imagine my surprise when the anchor windlass decided to jam. Bob was telling me to move the cam lever to loosen it. I couldn’t budge it, and he got all grumpy and came charging down from the pilothouse only to find he couldn’t budge it either. A few bangs from the boat’s rusty hammer and we were back in business, with anchor set and lovely views abounding. It had been a long day in terms of hours underway and miles traveled, so we took it easy, ate aboard the boat (Bob’s killer Thai peanut butter chicken and roasted potatoes!) and had a peaceful night. Safely at anchor in Garden Bay. Sportsmans' Lodge in Garden Bay. Good eats if you're in the neighborhood. However, tonight, Chef Bob is cooking.